Prior to the holiday, prospects for our gathering seemed a bit shaky, for Kimberly had spent the previous week in Michigan at her folks' place, and the weather forecast up her way wasn't looking promising for flying. However, much to our relief, her flights ran smoothly, and she flew in early Christmas morning, arriving at Mum's place just before lunchtime. 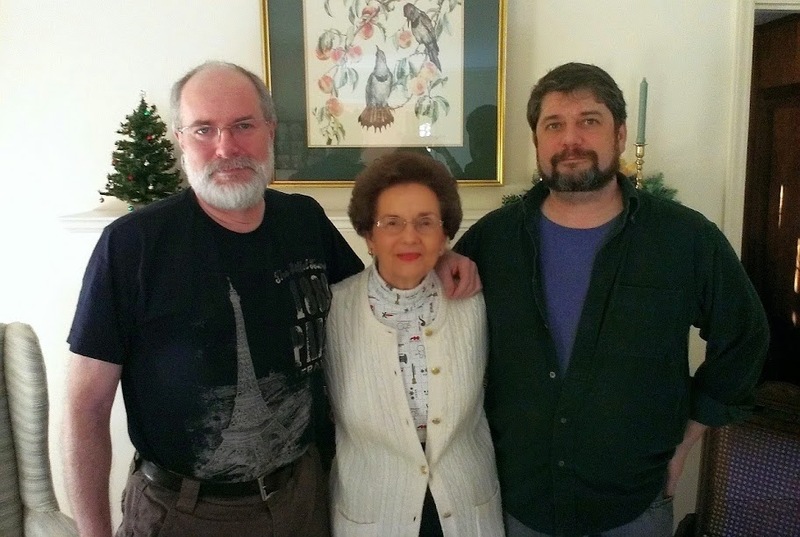 We also didn't know whether Brother Phred would be able to make it up from Winston-Salem, but he did — at least long enough to have dinner and spend a little time visiting. Mum's good friend Mary joined us, so our rag-tag gathering was complete. We had a fair feast of dead pig, scalloped taters, green beans, cranberry salad, and a couple of pies, including my traditional pumpkin pie, which I had painstakingly baked (using the recipe from the back of Libby's can). 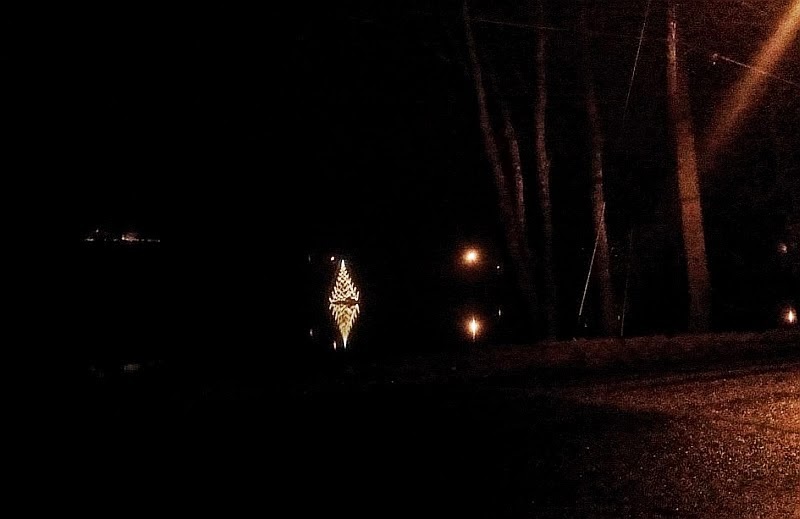 The past few years, folks in Martinsville have really done up some nice Christmas decorations, especially at Lake Lanier, just down the street from Mum's. This year, in addition to a fair display of lights at the boathouse and a couple of lit-up boats out on the water, they've added a huge, illuminated Christmas tree floating next to the lake bank where I won't admit to having fallen in some years ago (you can read about me not admitting it right here: "Anchors A-Weigh: A Random Klutz Story," November 27, 2014). Last night, to burn off a handful of the calories we consumed, Kimberly and I took a long, brisk walk through the neighborhood, which for me proved a highlight of the holiday. And we managed to fit in our annual viewing of A Christmas Story, which, I don't care what you say, is one of the most perfect comedies every made. Today, it was back to Greensboro for Kimberly and me, but I detoured over Danville way to hunt a couple of challenging geocaches. So, yeah, this has been a winner of a Christmas in my book. Next week, I do work the days before New Year's, but I've still got a bit of time off to enjoy before settling back into the regular daily rigors. I hope you had a merry one too. 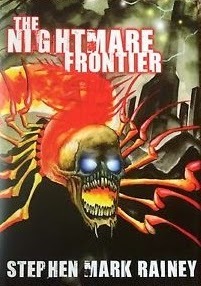 If you've not read my novel, The Nightmare Frontier, you've got a chance to get it as part of a rather massive bundle of reading material from Crossroad Press. 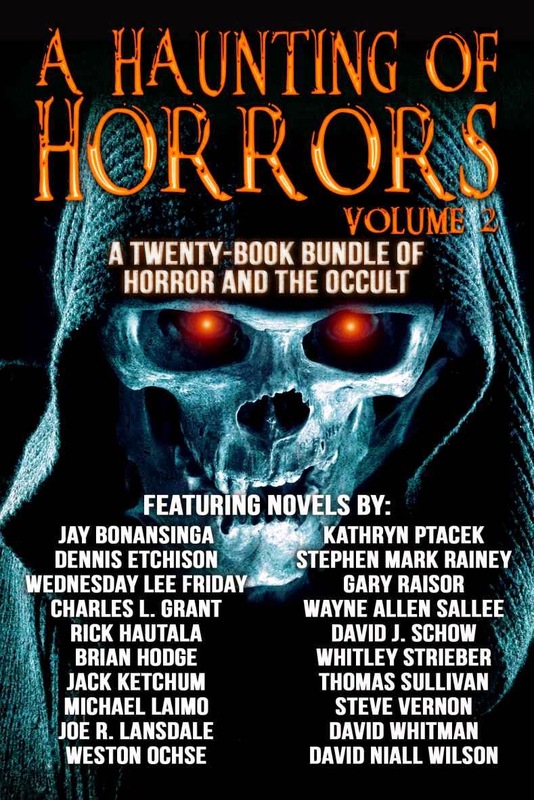 Twenty friggin' books in a Kindle package from Amazon.com — all of $2.99. As you can see from the contents shown on the cover image here, this is some killer company I'm keeping, so you really can't go wrong. So I'll tell you a little about The Nightmare Frontier. The novel was inspired by a waking dream — for me a very rare thing, and in this case, one that gave me one of the most terror-filled moments of my adult life. It was late evening, and I was drowsing on the couch in the living room, dark but for a few streamers of light filtering in through the venetian blinds. I was aware that I was lying on the couch, yet I was beginning to see images creeping up from my subconscious. As I lay there, I noticed a pool of warm, golden light forming at the corner of my vision. I shifted just enough to peer around the arm of the couch, and then I saw the source of the light. 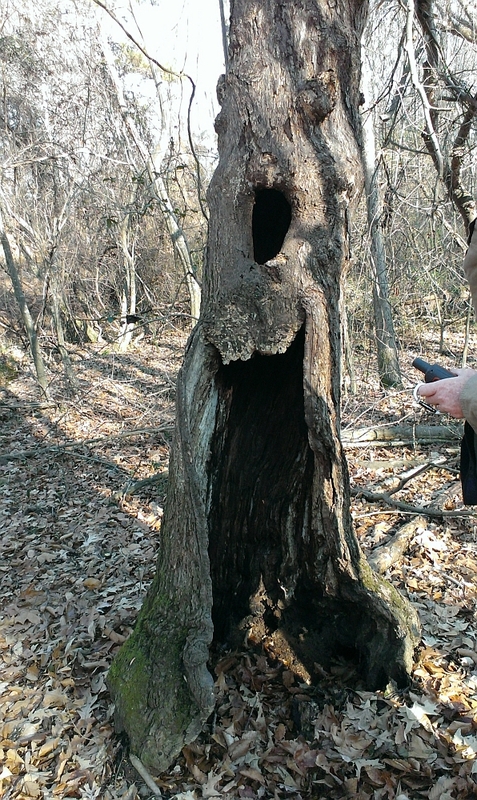 Cyclopean horror along the trail near one of the caches. The thing damn near swallowed Robgso. 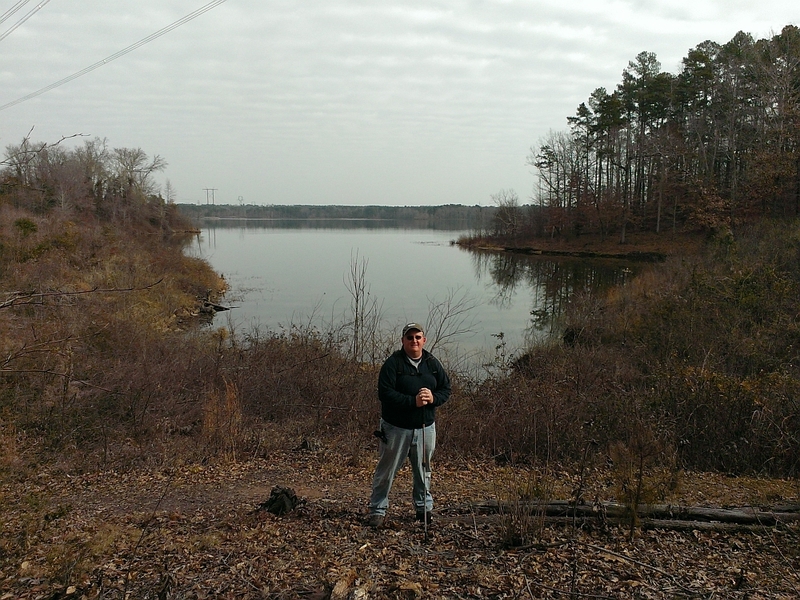 "The Hunger Games" is a series of 22 geocaches on the Mountains-to-Sea Trail along Falls Lake, near Durham, NC. The caches are all food. Steaks, hamburgers, sub sandwiches, grapes, peppers, ice cream cones, you name it. 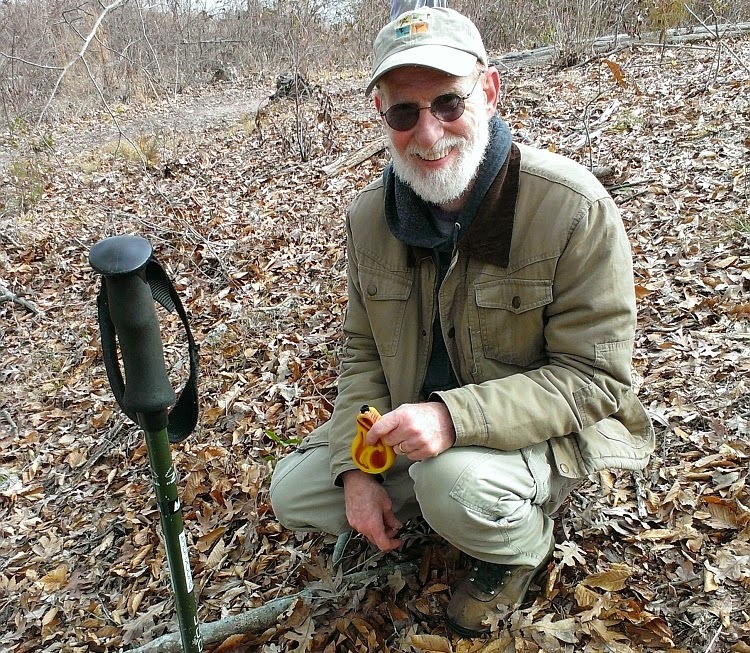 Well, yeah, they're dog chew toys with bison tubes hiding inside them, but it is kinda fun going through the woods and finding an ice cream cone hanging in a little cedar tree. Out on the trail today with Rob (a.k.a. "Robgso") and Robbin (a.k.a. "Rtmlee"), I was thinking, if a smart phone were really smart, when I entered the cache description into my notes, the phone would reply, "You just said you found an ice cream cone hanging in a little cedar tree. That's messed up." To date, my phone has never indicated that level of smartness to me. All total we hiked about six miles, and we managed to find the lot of the caches. Terrain here isn't too rugged, though neither is exactly flat and level. Since we had to go all the way to one end of the series and then hike back, we skipped every other cache so we'd have some to find going both directions. Good weather — mostly cloudy and gray, but about 45–50 degrees. We ran into one other geocacher of our acquaintance, and a couple of others we didn't know. As we neared the end of the trail, we kept hearing the howling of a dog (or, by the sound of it, possibly a werewolf) drawing distinctly nearer, and right about the time we were signing the log sheet, a couple of deer came bounding past, followed moments later by a rather less-than-ferocious-looking but highly spirited beasty dog. Once he saw us, Dog put the brakes on his pursuit, apparently bamboozled by our sudden appearance. By his prolonged hesitation and thoughtful expression, it was clear he was trying to reconcile in his mind how two bounding deer had transformed themselves into three old farts. Dog contemplated this anomaly for a couple of minutes, then shrugged and continued on his chase, presumably having come to the firm conclusion that nature is just plain strange. We weren't sure what he was going to do if he caught the deer, but my guess would be sit down and have a deep discussion about the things one sometimes encounters in the woods. Sometimes you find old farts. If you don't eat your meat, you can't have any pudding. It's recipe time! Yes! 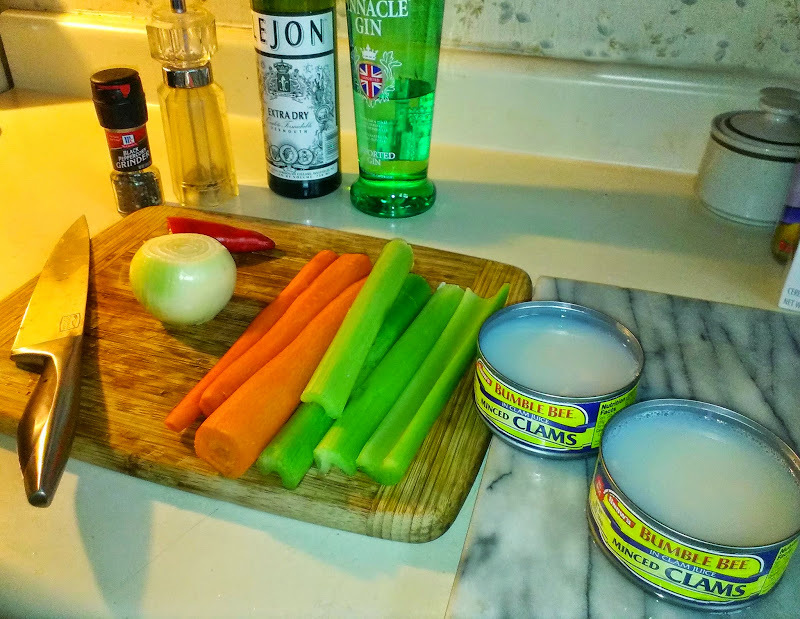 I love me some clam chowder, I do, and I much prefer the Manhattan style (red) to New England style (white) — though make no mistake, I will dive into either. My recipe, of course, is for the bloody red, and it's guaranteed to blow your eyeballs out of your head — which, if you frequent this place at all, you already know is my favorite kind of thing. The recipe below makes about six servings (do note that you can vary seasonings to your taste). So, take notes and abandon all hope ye who consume. Into a large soup pot, pour clams (with juice) and Worcestershire sauce; heat on stove top at medium-high until the pot begins to boil. Reduce heat to medium-low. Add Old Bay, lemon pepper, and sage; let simmer for about 15 minutes. 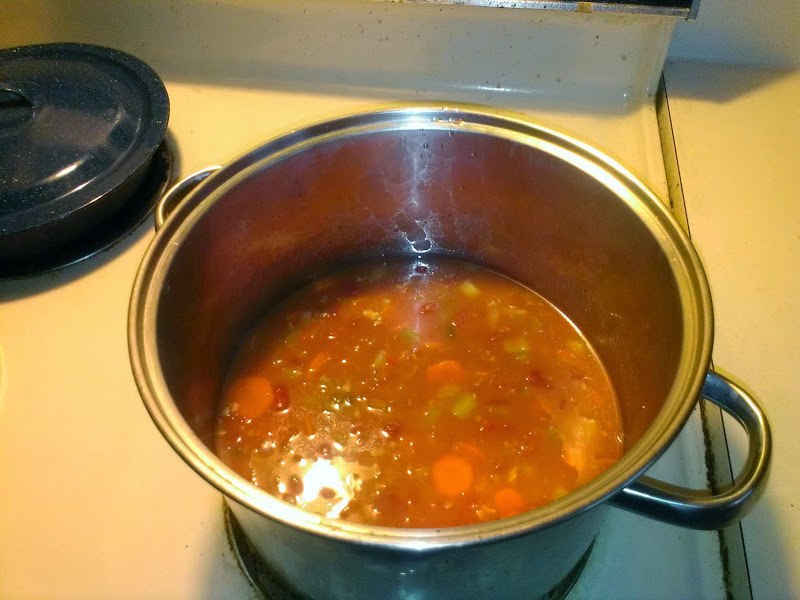 Stir in celery, carrots, onion, chili pepper, tomato soup, and Clamato juice. Add splashes of habanero sauce as desired. Let simmer on very low heat for at least two hours; this allows for a good blending of flavors while retaining just a touch of crispiness about the vegetables. Serve to unwitting victims, sit back, and laugh like the Controller of Planet X from Monster Zero. Enjoy some of this unholy concoction yourself. While, to some, red wine with any recipe involving sea creatures may be considered gauche, the chowder is red and spicy, so red wine is perfectly apt. To me, white wine is anathema to all that is holy anyway, so don't do it. (Perhaps someday I shall relate the experience from my dim, dark past that permanently put me off of white wine.) At any given time, I quite enjoy a bold, full-bodied dry red — a Zinfandel or Primitivo, maybe a Petite Syrah or Shiraz, a Malbec, or — as I did this evening — a rich California blend, which I found perfectly complementary to the chowder. 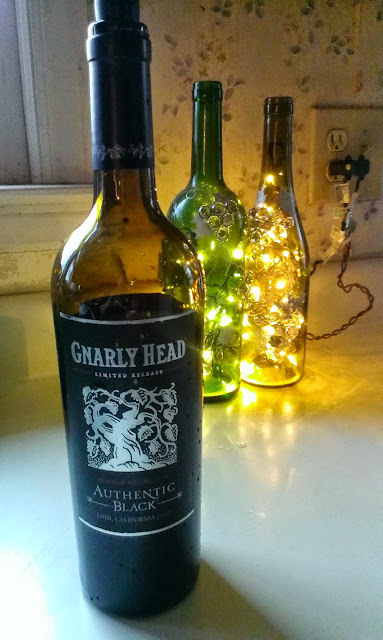 Tonight's selection, Gnarly Head Authentic Black, is a limited release; very inexpensive, most satisfying. Note: As with any Damned Rodan recipe, Spontaneous Human Combustion may result from even careful and conscientious handling of ingredients. Do not smoke cigarettes or imbibe this product near any open flame, inflammable materials, children, most animals (including hedgehogs, pygmy goats, and llamas), and overly sensitive individuals. Some time has passed, but the story ought be told. October 6, 2014. In anticipation of having company for the next evening's dinner, the ostensible master of the house put a couple of pounds of chicken in the crock pot to cook overnight. Early on the morning of the 7th, immediately upon awakening, the gentleman went downstairs to turn off the crock pot, which he determined to have performed its job quite admirably. Fully aware that certain young feline family members might display at least a passing interest in pot's contents, the gentleman maneuvered the device in question into a difficult-to-reach corner of the countertop — behind the coffeemaker and a few assorted condiment jars — and went to take a shower. Once done, some fifteen minutes later, he returned to the kitchen, anticipating that the chicken would have cooled sufficiently to be transferred to a different container. However, much to the gentleman's shock, the crock pot's contents were now strewn over the floor, the lid shattered into thousands of glittering pieces, the pot itself cracked, empty, and useless. Further to his bewilderment, the coffee pot and condiment jars remained exactly where he had left them, completely undisturbed, the crock pot apparently having been deftly maneuvered by something akin to Harry Potter magic. A quick examination of the nearby environs revealed three pairs of feline eyes peering at this new masterwork from various points around the kitchen, the artists apparently feeling quite bashful after rendering a composition unlike any they had heretofore attempted. Not to be outdone, our gentleman of the house spontaneously composed an original litany of growled, gargled, and shouted syllables, rather in the style of Darren McGavin in A Christmas Story, though augmented by original vocal flourishes and occasional threats of juggling cats at very high speed. What the man did not do — and history has likely not forgiven him for this — was take photographs of what surely would have proven to be a timeless masterwork. It is possible that there are plans in motion for some new, similarly grand composition; and in the occurrence of such an event, one can only hope that, for the sake of posterity, it will be better documented. UFOs! I swearz, the sky was full of 'em! I imagine one can find them anywhere in the US these days, but apart from here in North Carolina, I've never seen the dazzling arrays of light balls that have become so popular in recent years. They're quite impressive, particularly when hung in vast profusion, such as in a nice wooded neighborhood here in Greensboro, where literally every tree is loaded with them; in fact, I'm led to understand they originated in Greensboro. 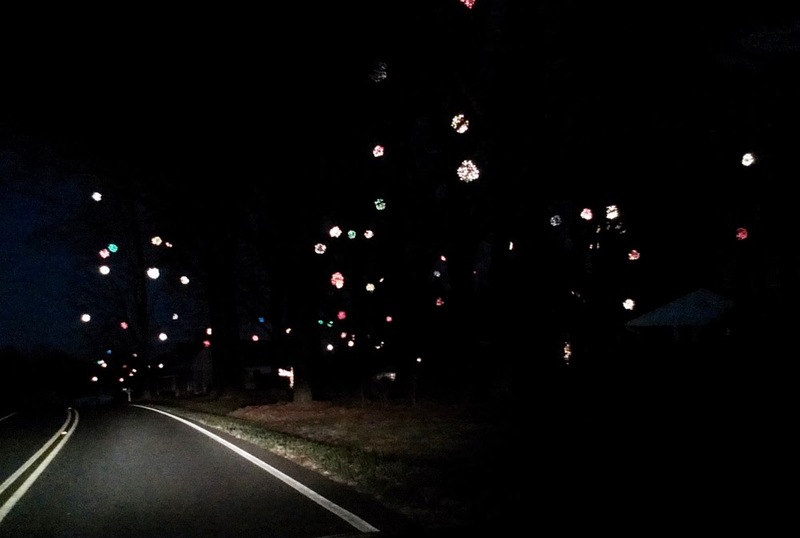 They're just balls of chicken wire strung with Christmas lights and hung high in the trees. Yesterday, Ms. B. and I paid visits to a couple of wineries over in the Yadkin Valley, and upon leaving Hanover Park, as we drove along this dark, lonely country road, we suddenly came upon the spectacle you see above. Of course, the photo can't do it justice, but the glowing spheres lit up the sky just about as far as the eye could see. Since there was no other traffic on the road, we just stopped the car and took a few photos (it's a pity neither my phone nor my digital camera are particularly suited for taking nighttime shots). I'm pretty sure I heard the strains of the five-note alien theme from Close Encounters of the Third Kind echoing from out of the darkness. These Christmas decorations do provide pretty damned good camouflage for drone spacecraft, you know. 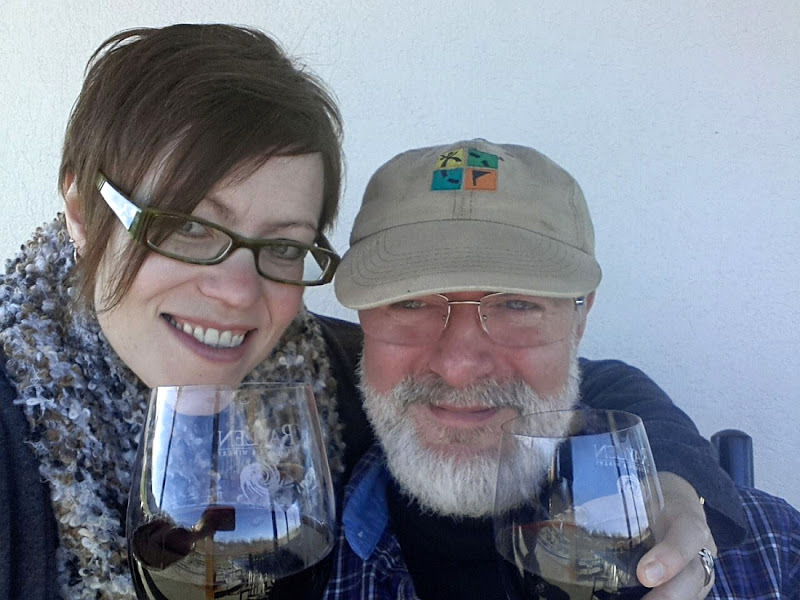 We had a pretty fair glow about us as well after our visit to Raylen Vineyards, near Mocksville, NC. Here's just what you need to get a little holiday spirit: an excerpt from my story, "Masque of the Queen," now appearing in Celaeno Press's In the Court of the Yellow King, available in paperback and e-book. It's a great Christmas present for all your friends — and even your enemies, yes! Here you go. You read. 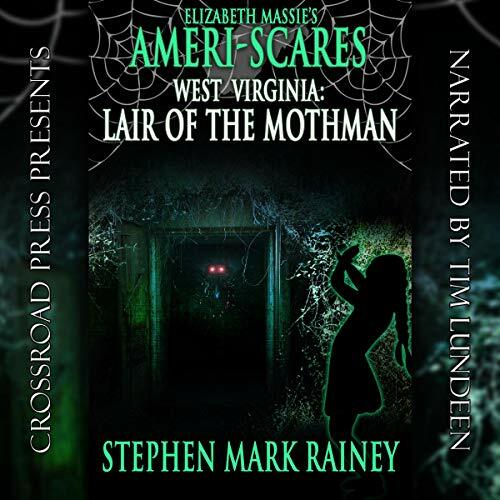 Sometime in the night, she woke to an odd flapping noise, unlike anything she had ever heard in her apartment. She rose and peeked into the darkened living room. Yumiko was not on the pullout sofa bed, and she didn't see Koki anywhere. The heavy flapping came again, and she now determined it originated outside her window, which overlooked the narrow alley. She drew up the venetian blinds and then staggered backward with the realization that she was not awake but dreaming. Where the opposite brick wall should have been there was vast, dizzying space: a midnight blue sky lit by alien stars over an endless body of inky water. High above and to the right, a huge, blood-red star lit the night sky, and she knew this was Aldebaran, the sun that blazed above the city of Alar. Around it, a cluster of stars — the Hyades — glittered like the jewels adorning Cassilda's diadem. And now, slowly, the rim of the silver moon breached the farthest edge of the Lake of Hali and rose until it resembled a cyclopean eye, its gaze burning through her body straight to her hammering heart. Then, on the horizon: an impossible array of gleaming, dizzying spires that wavered like ghostly tendrils before taking solid form behind the bright, full moon. Moments later, it came: the thin, childlike dream voice she had heard before; distant, barely comprehensible. No. 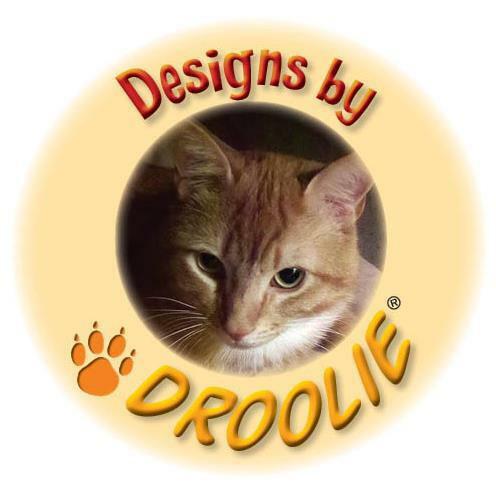 The word only sounded like "doggy." That wasn't what it had really said. It was still too far away, too difficult to understand. The flapping sound came again, and now, in front of those distant, luminous spires, a silhouette appeared in the sky, its contours vague, imprecise. It was coming toward her, trailing black smoke, as if it were on fire. A little clearer now, the reedy voice sounded excited. The shape in the sky was no clearer to her eye than the voice was to her ear. It seemed ghostly in its way, surrounded by an aura of indeterminate color. Was this what it was like to be color blind? It was neither gray, nor silver, nor white, nor violet. But it was color. Now the thing was rushing toward her, and she could see its eyes, burning with that indefinable, radiant gleam. She backed away from the window, knowing the thing was aware of her, had targeted her. Then a hand touched the small of her back. She spun around and looked down. Standing before her was the child she had seen at the play rehearsal. Even now, she couldn't tell whether it was a boy or a girl. Curly dark hair hung low over big blue eyes, its short, slightly pudgy frame garbed in a pale blue robe. Those eyes were too mature to belong to a child. The tiny, cherubic mouth spread into an overly huge grin, revealing two rows of polished, very large, very adult teeth. Check out In the Court of the Yellow King at Amazon.com. 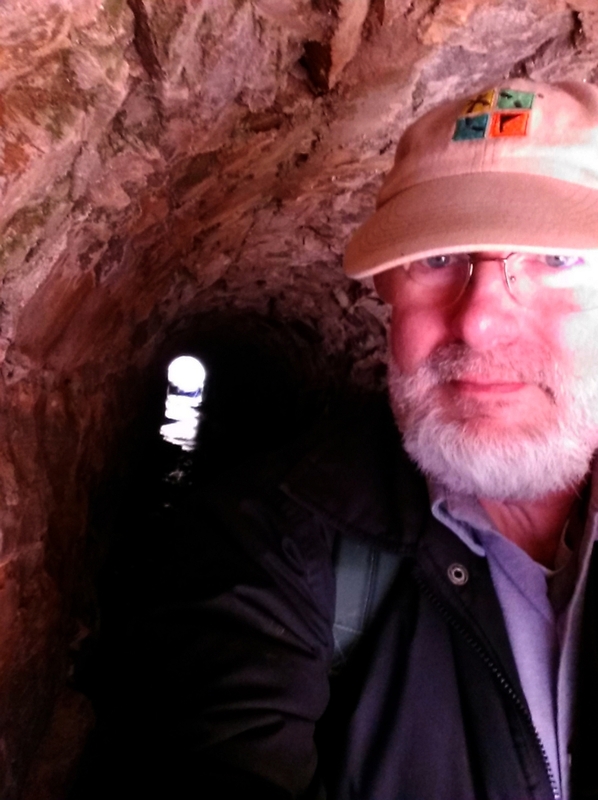 Seven miles, forty-eight finds, two DNFs, and one spectacular tumble down a hill. Not me, of course; Rob. T'was Rob what fell down the hill. That was our tally at the end of yesterday's big hike on the Richmond & Danville Rail Trail, out a ways east of Danville, VA. The Virginia Star is a relatively new piece of geoart, in which the cache icons on the geocaching.com map form a piece of art. There are star geoart formations in several states, and I've gone after the ones in Virginia and North Carolina — though I've unfortunately come up a cache or two short of completing both, which only means I'll eventually have to go back to find them. 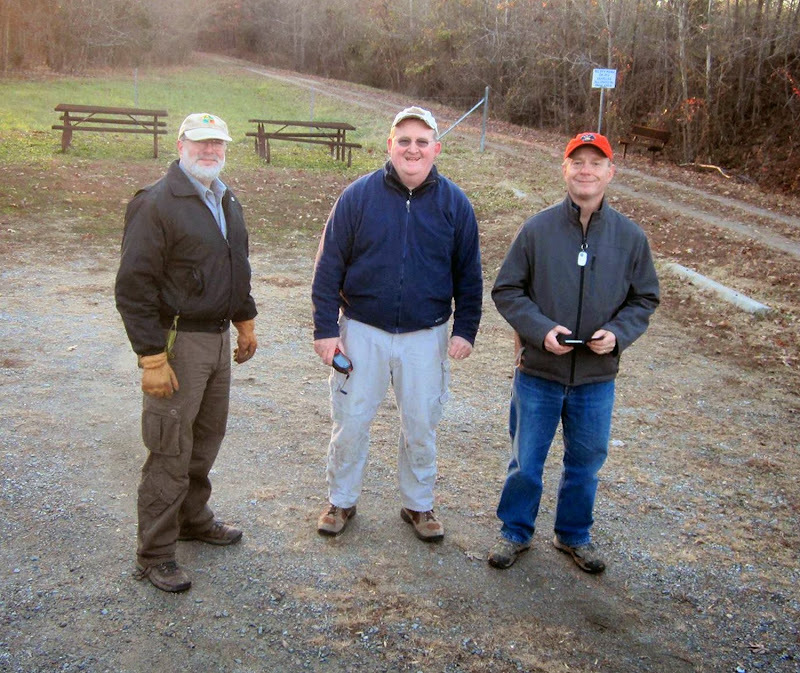 Sunday, December 7, Pearl Harbor Day: braving a relentless, oftentimes frigid nor'easter, a team of four old farts — Rob "Robgso" Isenhour, Robbin "Rtmlee" Lee, Scott "Diefenbaker" Hager, and I — set out to conquer the 50 caches that made up the star. 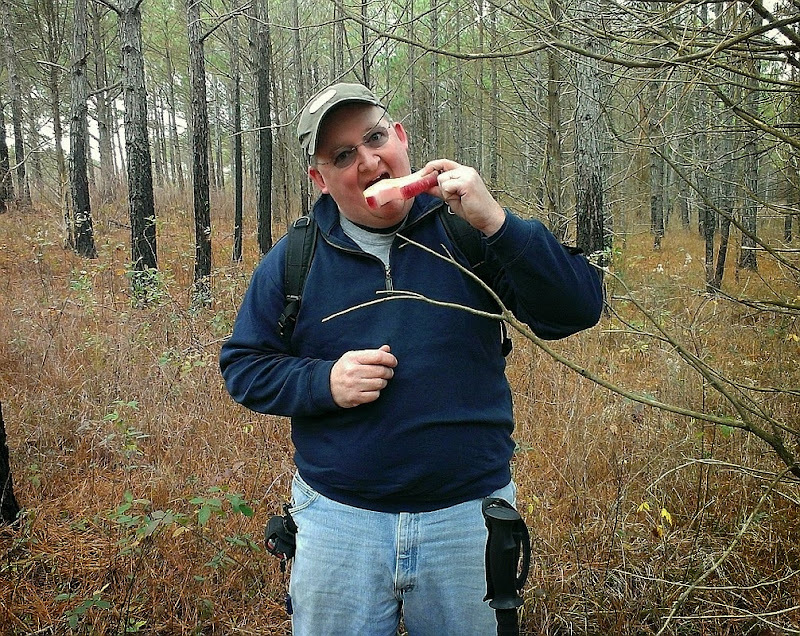 There were a couple of other caches on the trail to snag as well, so we had our work cut out for us. Unlike some geoart series, the caches in this one were not all similar to each other; they came in all shapes, sizes, and degrees of difficulty. Bison tubes stuffed in rubber rats; cut cedar logs with little trap doors that open to reveal the container; large, camouflaged boxes containing prodigious amounts of swag. All out there. End to end, the journey took about six hours and resulted in a few pairs of a slightly sore feet. One of our favorites along the trail actually wasn't a part of the star. It was called "The Night They Drove Old Dixie Down," and was located in a low-lying area just off the rail trail. 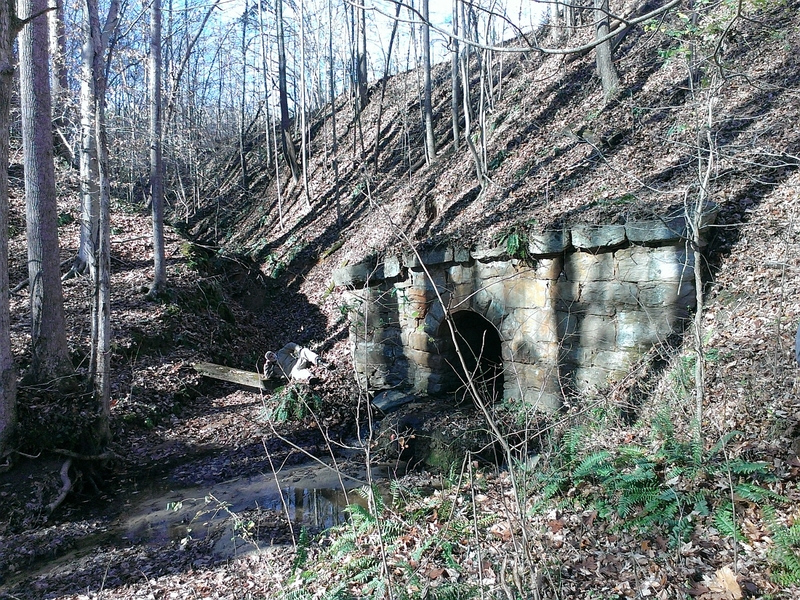 Here, in addition to the cache, we found a little scenic creek and a cool stone culvert that ran deep beneath the trail. This is also where old Rob put his pride before a fall and fell down. Happily, neither far nor hard, since it was a long way back to any sort of civilization or non-hoofing-it transportation. With typical Rob panache, he just adjusted his position slightly and posed for the camera. We will not speak of certain less-than-graceful descents into other areas while on the hunt, for they are not worth remarking upon. Pride goeth before a fall. Notice there's a brown pool near Rob's feet. There be his pride. which will require a return visit. Three of the four old farts; the fourth is behind the camera, licking his wounds. When kids do stupid things, sometimes ultimately costly things, too many of us are quick to automatically — and self-righteously — jump on the Blame the Parents bandwagon. There have been several instances in the news lately where youngsters — anywhere from preadolescence to late teens — have blown it big time. 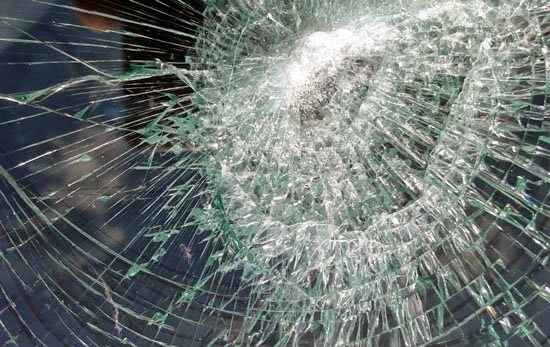 Locally, the most dramatic example was a teenage boy and his friends sneaking out in the middle of the night, taking his grandfather's car, and going joyriding, sadly ending in a high-speed crash that killed three of the four youngsters. I can't imagine the parents' grief. By all accounts, they were responsible people, doing the best they could to raise decent kids. They trusted that the youngsters had more sense than to go and do something so stupid. And fatal. And of course, before the kids' bodies have even cooled, here comes the condemnation from the masses. Oh, lord, the it was parents' fault. They should have done this. They should have done that. Why did they not lock up the car keys? Where were the damn parents? Where the hell do you think they were at 2:00 AM? They were asleep and unaware. The problem is that kids, even those who have been raised by the absolute best of parents, will rebel, they’ll sneak, they’ll do things that their folks can’t foresee, no matter how brilliant the parents are — or think they are. Peer pressure, for one thing, has more power than just about any parental influence. And you simply can’t be there all the time for a kid — not unless you’re a helicopter parent, which is an awful, awful way to raise a kid, almost bound to have more negative than positive consequences in the long haul. Do not mistake these words as some misguided defense of irresponsible parenting; they are not. I do not and will not defend lazy, half-assed, uninvolved parents. My point is about good parents whose children do bad things. Let me ask you. Do you remember what it was like to be a kid — especially during your teenage years? I sure do. I did a hell of lot of things that mortified my parents, as saintly as they were ("saintly" really is a good word for them). I did things that would have gotten me grounded for life if they had caught me. I barely escaped being killed on at least two occasions. And relative to... ahem... some folks of my acquaintance, I was one of the “good” kids; I knew there were certain limits set for my own good, and I usually respected them. Take note of the "usually" back there. Those times I did not, I was lucky, lucky, lucky enough not to get myself killed. But peer pressure can be powerful, and it can be insidious. I caved to it; the best of kids will cave to it. And the worst of kids... well, that speaks for itself, doesn't it? Conversely, as a parent, I had to deal almost daily with situations I couldn’t have foreseen in a lifetime. There aren’t always cut-and-dry solutions; what may work in one parent-child relationship won’t work for another. Falling back on blaming the parents always feels so good; it’s quick, easy, and doesn’t require much thought. But life and people are a lot more complicated than that. No one comes with an instruction manual. There are hereditary handicaps. Just because a kid is a kid doesn't mean his mind isn't independent and functioning quite differently than you think it is. There are infinite variables that shape a human life. Rarely can parents see or foresee all of them. For God's sake, get off your high horses. Your kids aren't as perfect as you think they are. They probably got away with a lot of stuff you don't know about. If you're lucky, it didn't kill them. Maybe try offering a little compassion before blindly spitting out blame.